​Since opening in 2005, Abilene Physical Therapy has been serving the Abilene and surrounding areas with exceptional skill and care. We enjoy helping residents of our community recover from injury and return to normal home, occupational and recreational activities. Tonya is a PT and owner of Abilene Physical Therapy & Sports Rehab. Tonya graduated from Wichita Stare University in 1990 and opened APT in 2005. Tonya has special training in Womens Health, manual therapy techniques for spine and ribs and she is also ASTYM and NESTA certified. Tonya enjoys the outdoors,gardening, traveling, cooking and a new hobby of scuba diving. She is married to Sean and has two sons Colton and Cade. Adam has been with Abilene Physical Therapy & Sports Rehab since 2008. He earned his Doctorate in Physical Therapy from the University of Nebraska Medical Center in 2004. He completed his undergraduate study at John Brown University in Siloam Springs, Arkansas. Adam has received certification in the ASTYM system, LSVT BIG treatment of Parkinson's disease and is a certified speed, agility, and quickness specialist with NESTA. He continues to provide Dry Needling treatment and complete further training in this area. He has also completed additional education in Vestibular Rehabilitation. Adam is originally from Siloam Springs, AR and continues to pull for the Razorbacks. He enjoys various studies and group activities with his church in Abilene and a favorite Bible passage is Romans 5:1-8. He and his wife, Kari, have three daughters: Madelyn, Kamryn and Leah. He can often be found working in his yard and garden, playing ball in the yard with his girls or enjoying other sporting activities with his family. Roxi is a 2015 graduate of Wichita State University's Doctor of Physical Therapy program and earned her undergraduate degree from Tabor College in Athletic Training. She was born and raised in Abiene, where she graduated from AHS in 2008. Roxi has experience with primarily orthopaedic and spine rehabilitation and is certified in Functional Movement Screens. Roxi enjoys spending time with her husband, Austin, and their dog, Walter. In her spare time, she likes to be active, be outdoors, and be surrounded by friends and family. Chris started working at Abilene Physical Therapy and Sports Rehab in June, 2017. He received his Bachelor’s Degree in Kinesiology from Louisiana Tech University where he also played baseball for four years. After his senior year, Chris was drafted in the 33rd round by the Cleveland Indians which he played two years in their minor league system. He earned his Doctorate in Physical Therapy in 2015 from Southwest Baptist University. Chris has received certifications in Functional Movement Screening, Y Balance Testing, and Blood Flow Restriction Training. ​He was born and raised in Kiowa, KS, and continues to be involved in various athletic programs including hitting/pitching lessons and speed/conditioning programming. In his spare time, Chris enjoys spending time with his wife, Hillary, as well as family and friends. He enjoys playing sports, hunting, fishing, and being outdoors. Angie grew up in Abilene. She attended Kansas State University (Go Cats!) receiving a BA in Speech Pathology and Audiology. After working in the physical therapy field as an aide for 4 years, she entered Washburn University's Physical Therapist's Assistant Program. After graduating, she worked in a hospital setting serving inpatients, outpatients, and home health. Angie has been with Abilene Physical Therapy & Sports Rehab since 2005. She has extensive training in manual therapy techniques and is ASTYM certified. She also has training in balance and fall prevention, vestibular rehab and biofeedback for incontinence, and LSVT BIG for Parkinson's Disease. 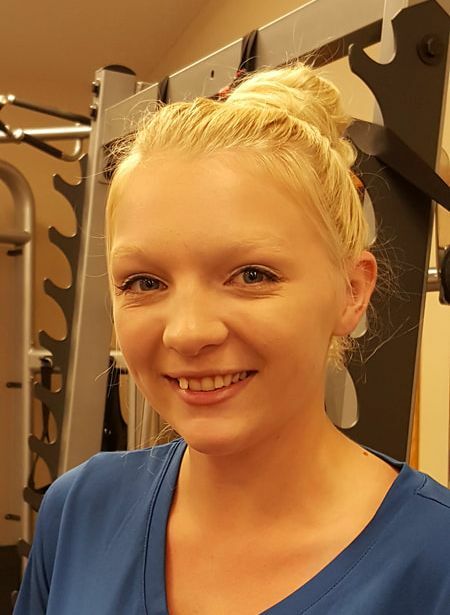 "I love physical therapy and the opportunity to meet new people. Helping them get better is the best part!" Stephanie is a 2014 graduate from Hutchinson Community College Physical Therapist Assistant program. She started her career at a local hospital serving inpatients. She's been with Abilene Physical Therapy & Sports Rehab since June 2016. Stephanie graduated from Chapman High School in 2009 and enjoys spending time with her husband Trent and their dogs, Tucker and Carlos. In her spare time Stephanie enjoys the outdoors and time with family and friends.